Space: The never-ending and all-encompassing void, home to all the stars and our universe. On Earth, however, space is a precious thing – one that we usually take for granted. We collect endless items, thinking we have enough room for everything, but that isn’t always the case. So, what do you do when you don’t have the room inside your home for all your items? We asked Irene and Emma from Spacer for some space-saving hacks for the home. It might seem like a strange idea, but cables can make your floors look messy and cluttered. Keep them in order by feeding them through clip binders and resting the charging piece on the metal. You can even pair this up with a DIY box to store the heavier chargers and cables while not in use. Binder clips are also a great way to keep earphones untangled and on hand. Every bed has linen, pillow covers and quilts to go with it. 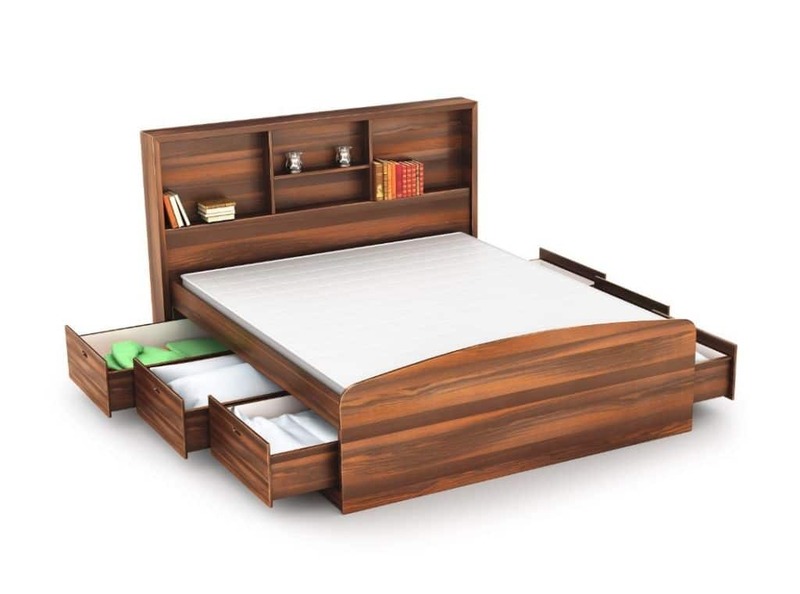 If you’re hard pressed for closet space, you can purchase a bed frame with inbuilt draws. Combining storage space with your bed allows you to keep your linens within arm’s reach. If you don’t want to invest in a bed frame with drawers, try a DIY with IKEA furniture. Or, if your bed frame has enough space underneath, purchase cheap plastic storage containers from Kmart or Target to create makeshift draws. If your bedroom is looking a little too lived-in, with your things everywhere, you might like to install shelves around the perimeter of your room. These can be purchased cheaply from IKEA. You can put anything on these shelves such as books, jewellery, pot plants, trophies and even stationery. It’s very useful for the living room and kitchen as well, providing a storage space for pots and pans. Brighten your space by displaying your knickknacks on a canvas pin-board. An easy DIY, paint your canvas any colour you like and pin all your birthday well-wishes, postcards or small trinkets to the board. This trick gets your souvenirs off the floor and out of boxes, turning them into personal art pieces. An alternative to displaying your trinkets on a canvas pin-board, create a storage box behind your paintings. A simple DIY, this storage technique is a great way to hide your valuables, all without taking away from your decor. If you have larger items like bicycles blocking your hallway, consider suspending them in the air or on the wall. You can use hooks or, if you don’t want holes in your walls, there are detachable pegs that attach to the walls and don’t damage paint or wallpaper when removed. This is another neat trick for kitchenware, turning day-to-day items into wall features. A classic way to store things like toys, shoes and linens, ottomans can also be used as seats. More colourful options are often used to add a splash of brightness to your living room. These dual-purpose ottomans are ideal for storing day-to-day items such as toys and shoes. A huge space-saver, ottomans are great furniture pieces and make your belongings easily accessible. A great option for dog-lovers, turn your couch side-table into your dog’s hidey-hole. Combining as much of your furniture as possible is a go-to space-saving technique. This trick is another great combo, keeping your dog close to the family for movie nights. Remove the need for a coffee table all together! Drink perches are a great way to prevent coffee spills while relaxing on the sofa. Their small size makes them easy to pack away and they are a great design feature for your living room. Not everyone is lucky enough to have a walk-in closet or inbuilt wardrobe. For those who have a section of their rooms parted off with shelving, we recommend opening the space to reduce the clutter. Leaving your wardrobe exposed and hanging in plain sight can increase the perceived size of your room. It will also make daily routines easier, allowing you to simply peruse your choices. You can even put shoes underneath the clothing rack to see how the entire ensemble will look. Are you into painting, sewing or card-making? Hobbies are excellent but can potentially be extremely messy ventures. A great solution is a collapsible hobby table. Avoid losing bits and pieces by keeping all your kit in one organised, easily transportable case. You can even move your hobby around the house or head outside. Staircase storage is an extremely popular space-saving method – and rightly so. While it may be a bigger renovation job than our previous tips, some of the more modern twists change the concept from being purely practical to a unique feature. Over the past two years, bookcase stairs have been gaining popularity. The easy-access shelving displays your books while tucking them neatly out of the way. Save even more space by ditching the clutter. Check out our guide to decluttering your home, room by room.